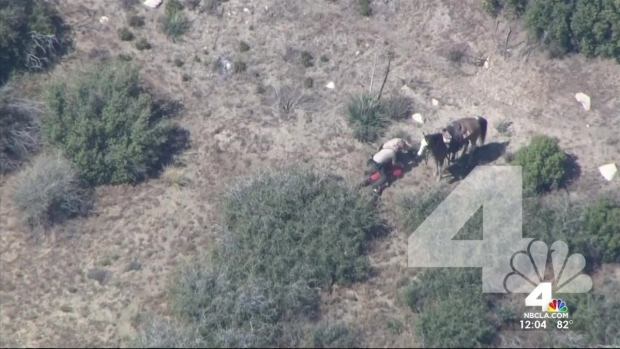 San Bernardino County sheriff's deputies were captured on video by an NBC4 News helicopter beating a man after a car chase and horseback pursuit. Three San Bernardino County sheriff's deputies accused of beating a man who took off on a horse say their actions were justified. Nicholas Downey, Michael Phelps and Charles Foster pleaded not guilty in court on Tuesday. The deputies are accused of beating 30-year-old Francis Pusok at the end of a long pursuit in San Bernardino County — a beating filmed exclusively by NBC4. Ten deputies were placed on administrative leave April 10, a day after the incident. The names were released of the 10 San Bernardino County Sheriff's deputies who beat the man who led them on a horseback pursuit. Tony Shin reports for the NBC4 News at Noon on Monday, May 11, 2015. But three deputies were charged in the case. The beating happened after Pusok, of Apple Valley, led them on a nearly three-hour pursuit that began when authorities tried to serve a warrant in an identity theft investigation that Pusok's attorney said had nothing to do with him.